William George Plumridge was born on January 16, 1921 to parents William Henry Plumridge and Ethel Pusey in High Wycombe, Buckinghamshire. William was the second eldest of four children; Dora (half-sister, born 1917), Joan (born 1925) and David (born 1929). 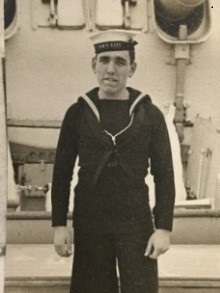 William joined the Royal Navy at a relatively young age and was soon after posted to HMS Ajax. He was only 18 at the time of the famous Battle of the River Plate and served as an important member of the gun crew. William married Elsie King in 1943 and together they had four children; Ann (born 1946), Jennifer (born 1950), Robert (born 1951) and Susan (born 1952). William remained with the Royal Navy for most of his working life, serving on several ships throughout his career. By 1951 he was ranked as a Senior Commissioned Gunner and by 1965 he was Lieutenant Commander. By 1970 William served HMS Bellerophon, a ‘stone frigate’ teaching ship. He would have been 49 years old. After service in the Royal Navy William joined the Royal Mews, the official body in charge of all road travel for the Royal family. While with the Mews he was directly involved with the Royal Carriage and took great pride in his role. William Plumridge died on March 8, 2007 at the age of 86. Original document and image located in the Ajax Archives.